Step 1: Click on "Create New Principle" on the home page. Step 2: type a statement in the box marked "if" You may not use the word "not", and you must use a variable of the form @[number]. If you wish to indicate that a statement is negative, you must use "~" at the beginning of the statement, as below. You can join up to 2 statements by using "&&" between the statements. 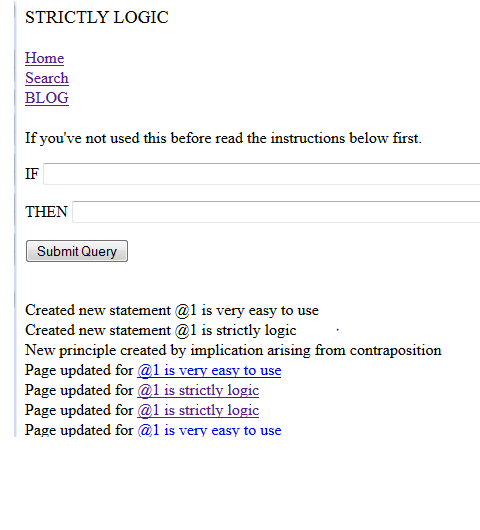 Step 3: type a statement in the "then" box. Then click "submit query". You cannot join two then statements. If you wish to do this, state the two thens as separate statements following from the same if(s). Step 4: On the next page, see if any of the matching statements are identical in meaning or would otherwise be suitable for making your point. If so, click on the radio button next to them. If not, click on the statement you typed in. Step 5: Determine whether your statement is always true, not always true, undiscernible. Note that "not always true" is not the same thing as "always false". To indicate that a statement is always false, type it as a negative using the tilde (~) and select "always true" (e.g. if you wish to say that X never comes after Y, you would do if: @1 is X then: ~@1 comes after Y. Then you would indicate that this is "always true".) However, the bare word "false" is used on this site interchangeably with "not always true". Step 6: Click submit and enter your statement into the system as a "principle". The system will automatically logically link your statement to others if you have connected it to statements that have already been entered. Step 7: You can click on the pages to see the arguments the system has entered. If you have not done so already, you may vote on whether these statements are true or not. The system will use truth values to update the "implied status" of linked statements. Step 8: To add to your argument, enter more arguments that include statements that you've already entered as part of a principle.